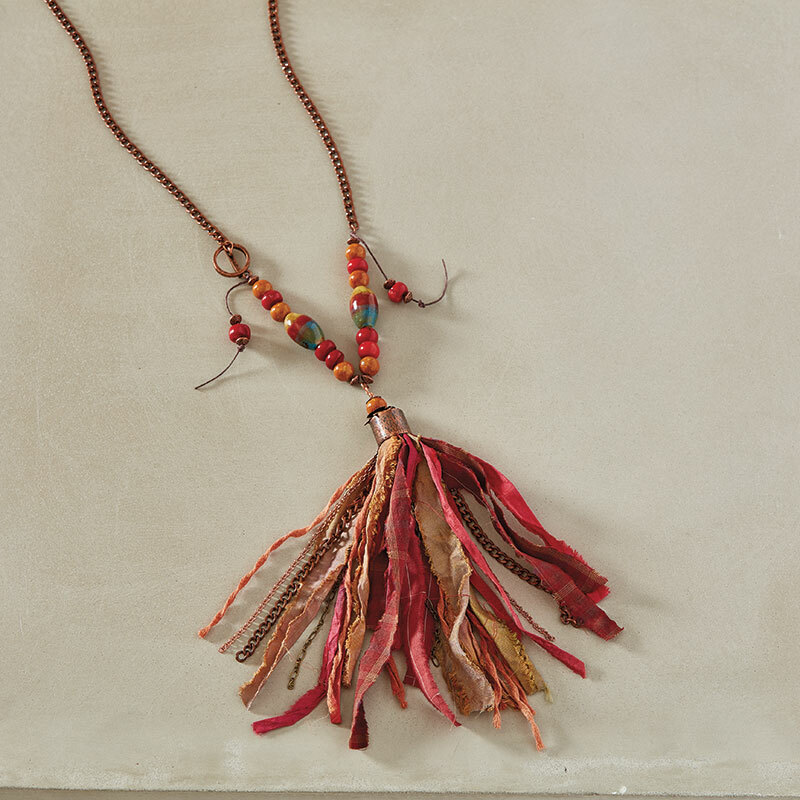 From elegant and demure to big and bold, the tassels in these nine projects showcase the many different looks that leather, chain, cord, and fabric can lend to your jewelry designs. Find this collection today in Beadwork August/September 2018. Add a little vibrancy to your wardrobe with fall’s most desirable hue. 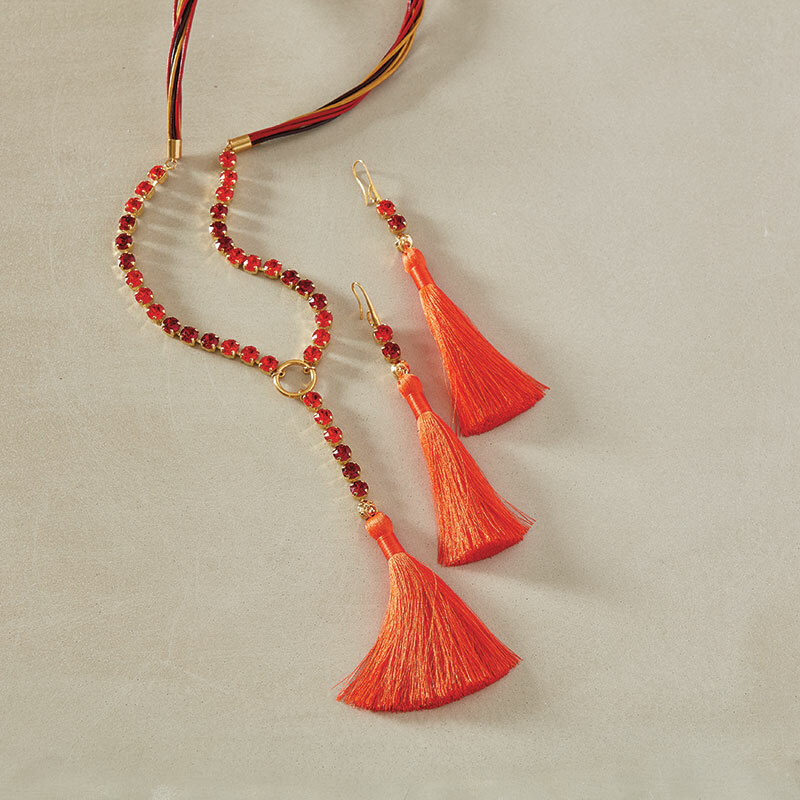 Assemble cup-chain bracelets filled with orange and red crystals, then combine with leather and a premade tassel for a necklace that wows! Option: Use similar techniques to make matching earrings. FERNANDO DASILVA is a jewelry designer, published author, and trendsetter, as well as an avid cook. His designs have been featured on Women’s Wear Daily and in Harper’s Bazaar. Follow Glamnando on Instagram to chart his bold style. 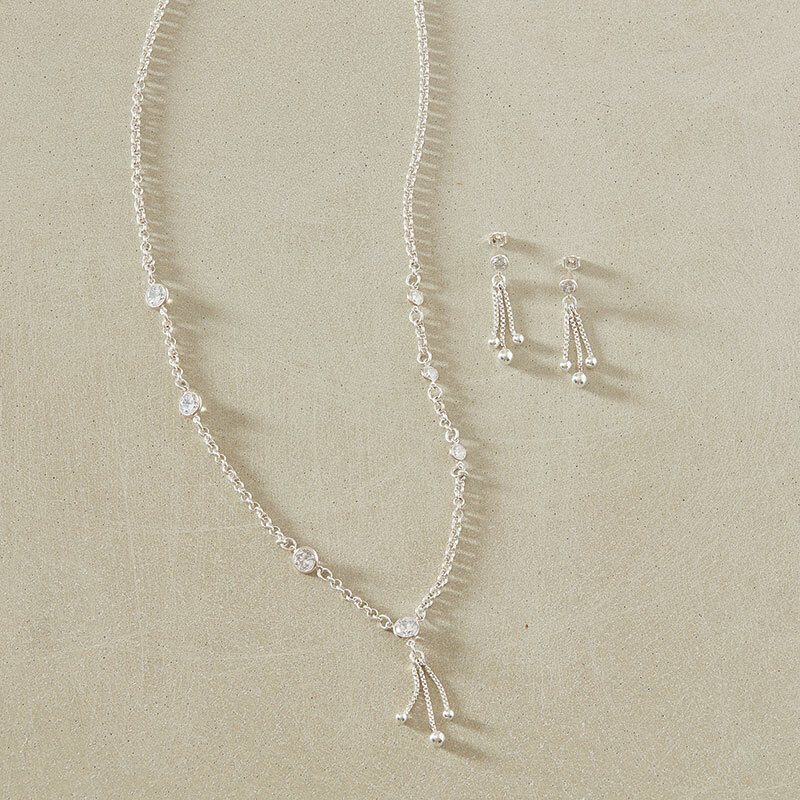 Create a tassel that sways as you move by making a custom cone with sterling silver wire and attaching beaded chain and a sparkling crystal. SANDRA LUPO is a New Jersey artist who teaches at bead shops, museums, and Bead Fest events. She also creates instructional videos and contributes how-to projects to various publications. As an inventor, Sandra is excited to share her designs, instructions, and demos based on her Conetastic Cone Mandrel Tool Set and accessories. Watch some of her videos and contact her at www.sandsstones.com. 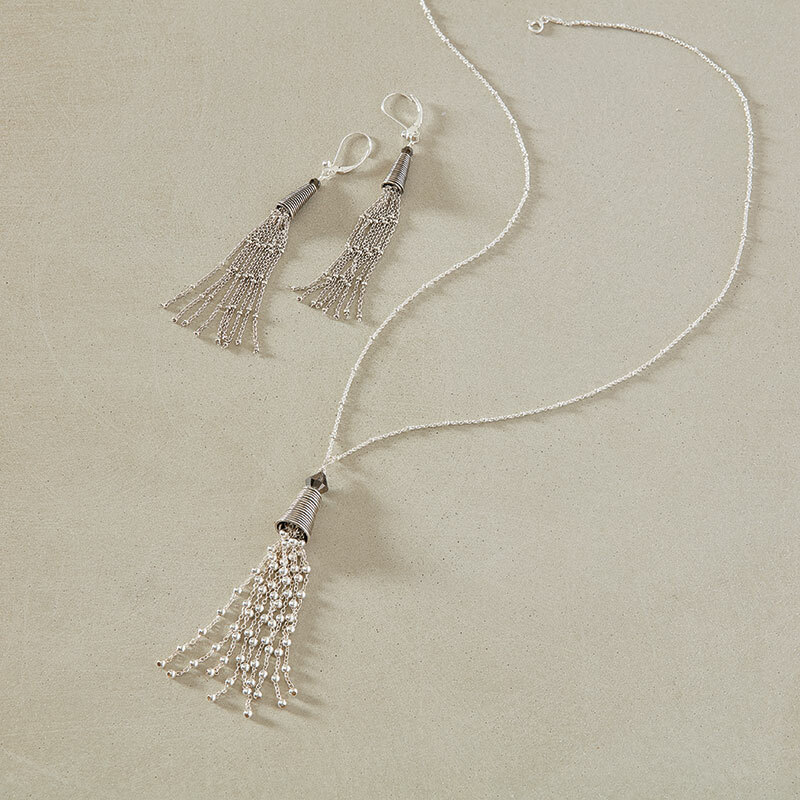 Sterling silver is beautiful on its own, but a few offset cubic zirconias and a tassel really make it sparkle. Use jump rings to connect all the components together for super-easy assembly. ERICA STICE is the studio coordinator at HalsteadBead.com, where she enjoys hosting monthly Facebook Live posts and writing for the Halstead blog. 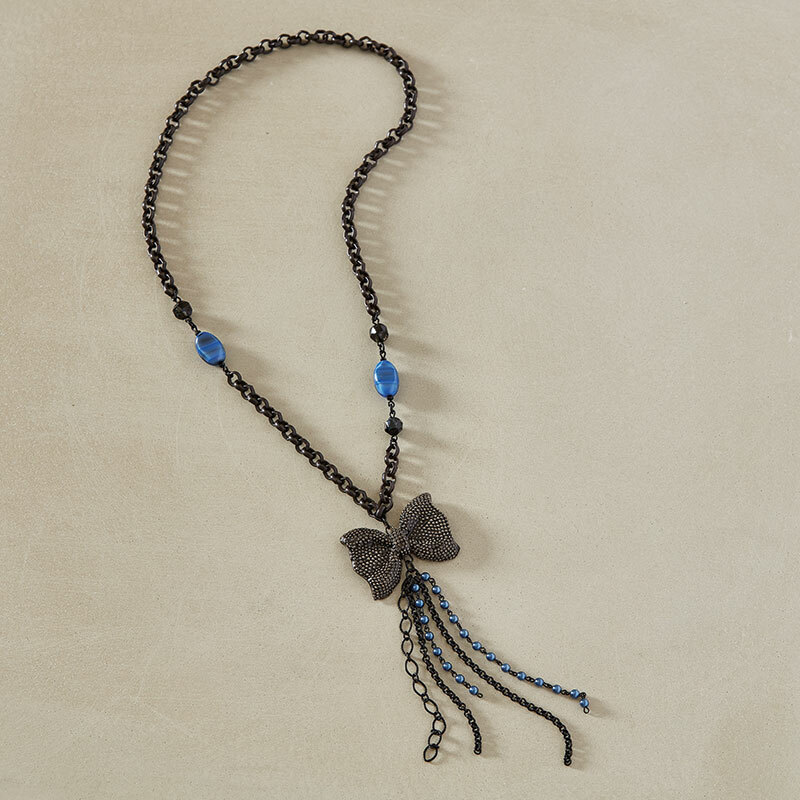 Create a rustic-style tassel from sari silk ribbon, then add sparkly links of crystal and glass for a modern take on the timeless tassel trend. 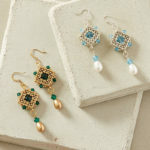 DEBBIE BLAIR is the former editor of Jewelry Stringing and Beadwork magazines. She currently enjoys the challenge of teaching art and jewelry classes in her local community. See what she’s up to at www.pinkdahliacreative.com. 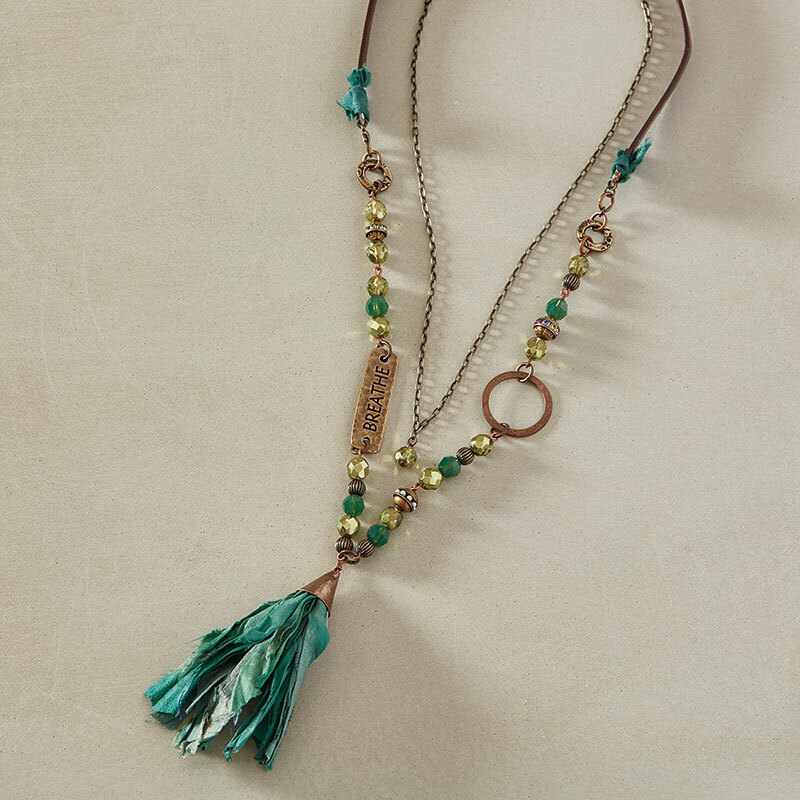 Use a combination of your favorite chains and a beautiful artisan ceramic connector to create this stunning tassel necklace. Unique vintage and Czech-glass beads enhance the elegance of the design. MICHELLE McENROE has been making jewelry and designing beadwork since 2008. She is a regular participant in the monthly challenge at www.art bead scene studio.com, and her work has been published in numerous magazines. Michelle enjoys the sunshine in Plano, Texas, where she lives with her husband, a large collection of guinea pigs and bunnies, and her three adult children when they are home. Visit her Etsy shop at www.mcenroemoments.etsy.com. A small tassel doesn’t necessarily mean a simple tassel. This design features a unique approach to wire wrapping for a fun and sassy focal. 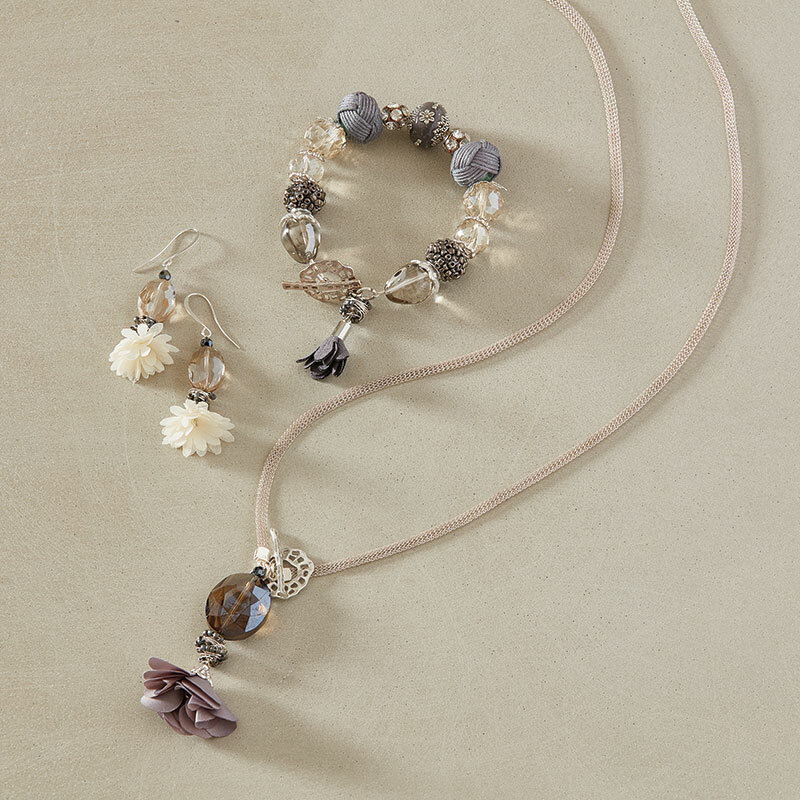 Option: Use similar techniques to make a matching bracelet and earrings. NEALAY PATEL works as an art director in Tulsa, Oklahoma, and designs for Jesse James Beads. He practices his craft by designing, teaching, and publishing various works of jewelry. His accomplishments include authoring three jewelry-making books; hosting workshops at various trade shows; appearing on Beads, Baubles & Jewels and Jewel School on JTV; and maintaining his own brands, Beads & Bubbles and SilverSilk & More. Use recycled shirts, leftover ribbon, yarn, and strands of chain to create a one-of-a-kind tassel. And, for the tassel cap, shop the plumbing aisle at your local hardware store! TERRY RICIOLI divides her time between her grandchildren, designing jewelry and craft items, and teaching art to homeschoolers. Find her work at www.terryriciolidesigns.blogspot.com. 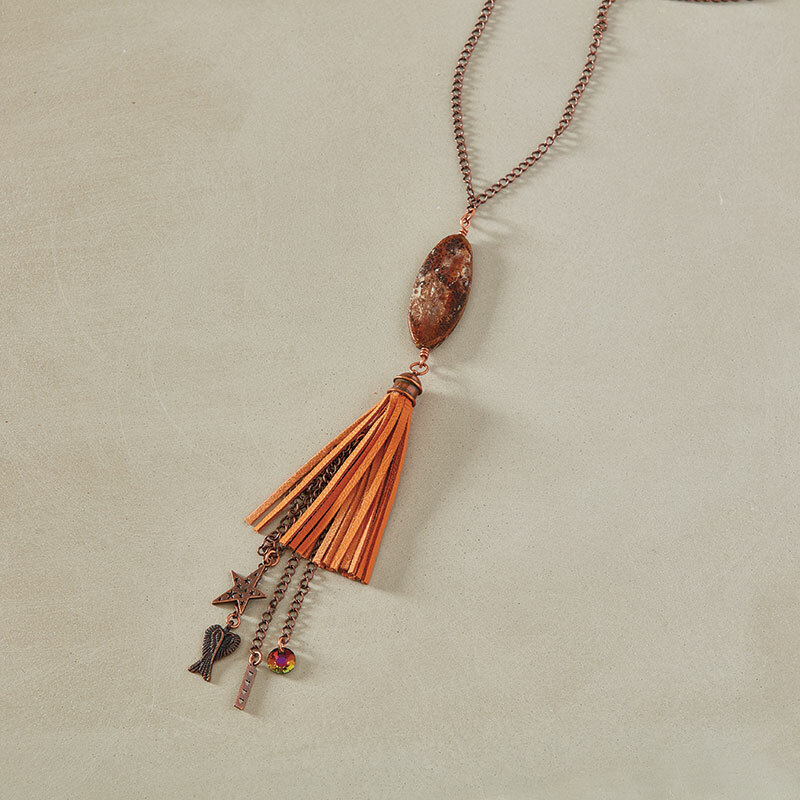 Use leather fringe and various lengths of chain adorned with crystals and charms to create a modern tassel design with loads of personality. 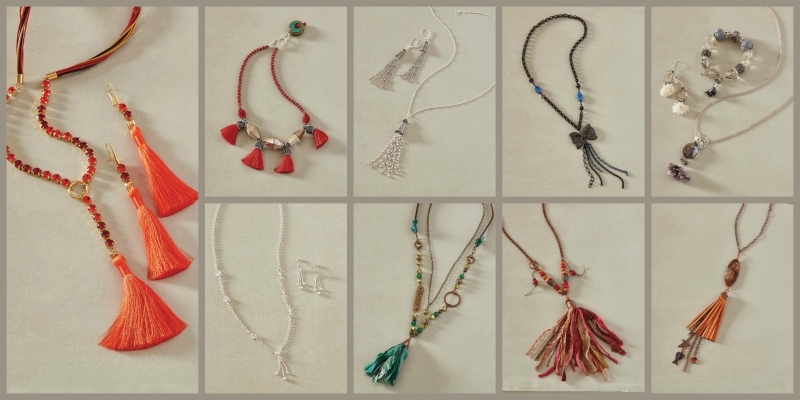 TAMARA HONAMAN is passionate about all forms of jewelry making, including bead weaving, mixed media, metal clay, and wire. Tamara shares her knowledge and designs through video and print, at live events, and on social media. Find her at www.tamarahonaman.com. 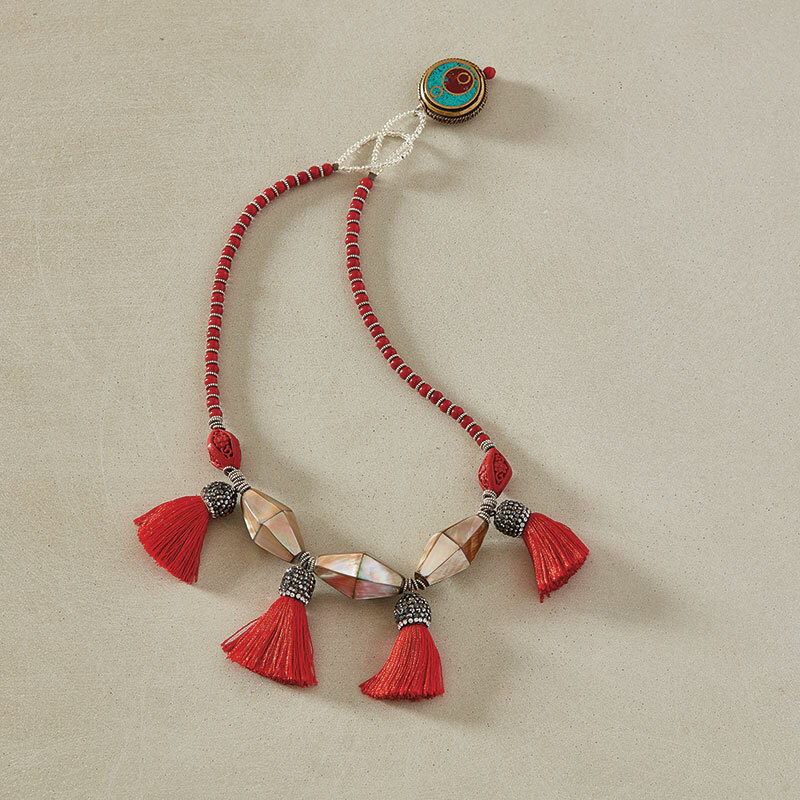 Like the town on the Silk Road that is its namesake, this piece combines elements from disparate regions, including imitation cinnabar, bamboo coral, shell, and a vibrant-colored Tibetan bead. ANNE PERRY is the director of two learning centers in Southern California. She has been beading in her spare time ever since her best friend cleaned out her craft closet and gave Anne all of her beads. Download these patterns plus 11 bead weaving patterns when you purchase the August/September 2018 issue of Beadwork..